In an effort to better tell the story of my mission and the wonderful experiences I had, for the benefit of my children and the audience of this website, I thought it would be good to put together a one-pager on each one of my mission areas. This is the first such article, about the Gazano Branch in the city of Paraná Argentina, where I was serving from Dec. 27, 1995 to Apr. 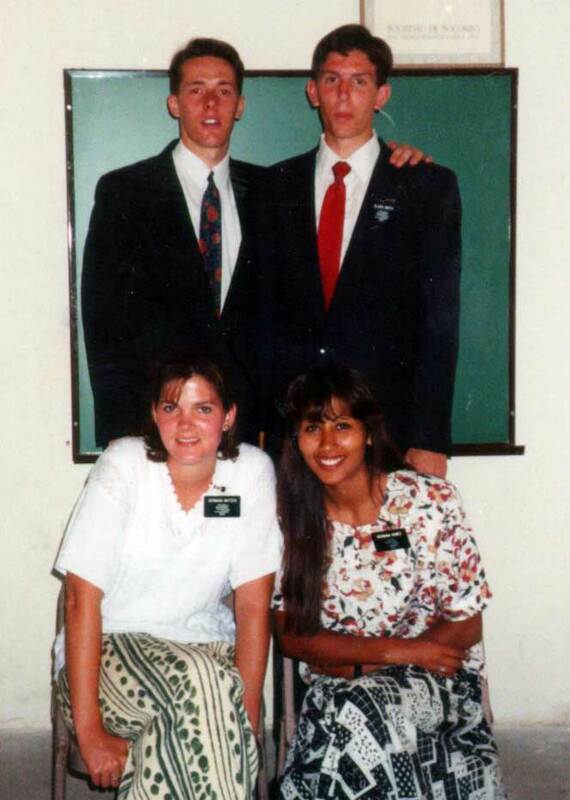 2, 1996 in the Rosario Argentina Mission. On a side note, I’m lucky to have any pictures from my first month in Argentina. My first roll of film on my mission, which consisted of probably a dozen photos from the MTC and a dozen from my first few weeks in Argentina, did not turn out. It was the first time in my life that I had my own camera and I must not have loaded the film correctly because all the pictures turned out blank. 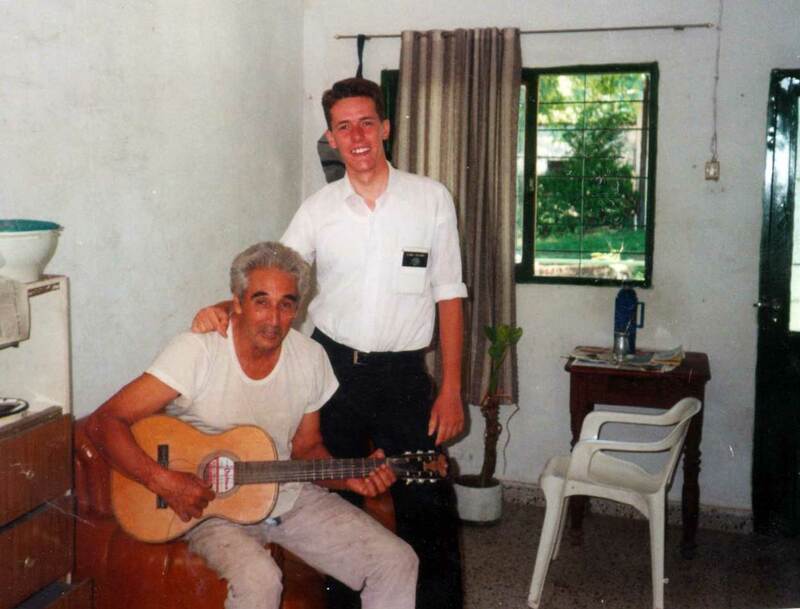 The pictures I do have from those first weeks in Argentina were donated by my first companion there, Elder Loesener. Thank you! This picture was taken on or around my first day in the mission field. When I arrived in my first assigned area, I was part of a trio instead of the normal two person companionship. 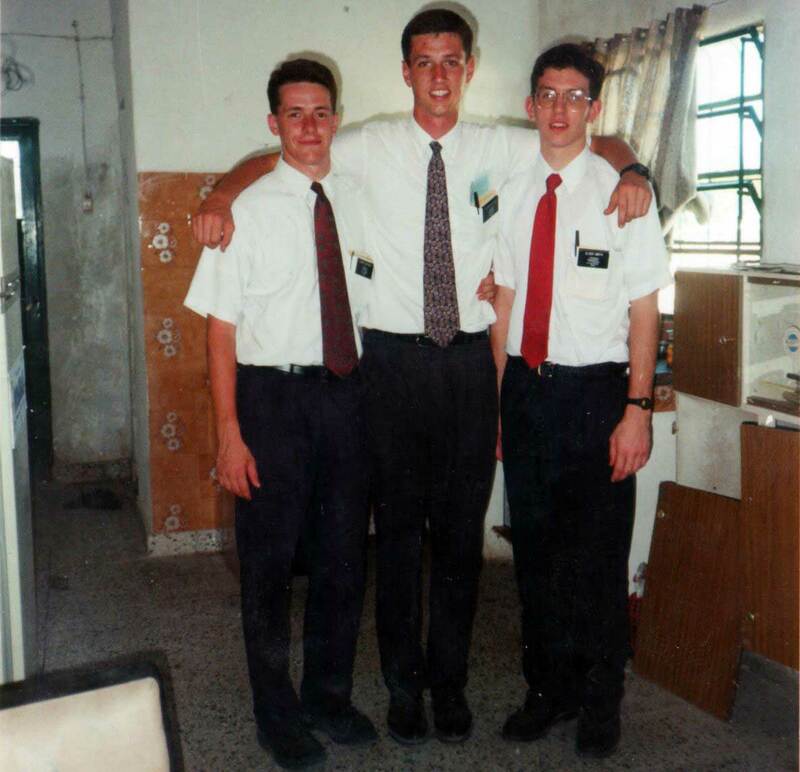 This is a picture of the trio: Elder Loesener, Elder Ballou, and myself, Elder Smith. It was taken in the kitchen of our apartment. Right behind us is the sink and stove. To our left is a cabinet we kept dishes and food in. To our right was a refrigerator. This was one of the few apartments I had during the mission that had a fridge. I didn’t realize at the time what a luxury it was. The photographer, most likely the owner of the home, was standing in the living room of the, obviously, small house. Off to the right of the house were three room, one bedroom from the owner, one bedroom for the missionaries, and a study room with a desk for the missionaries. The trio only lasted a day or two. Soon we got word from the zone leaders that Elder Ballou had been transferred and the next day he was gone. This was the back yard of the home where we had our apartment in Gazano. Every Monday, we washed our clothes in the sink, in the right of the photo, and then we hung them out to dry. 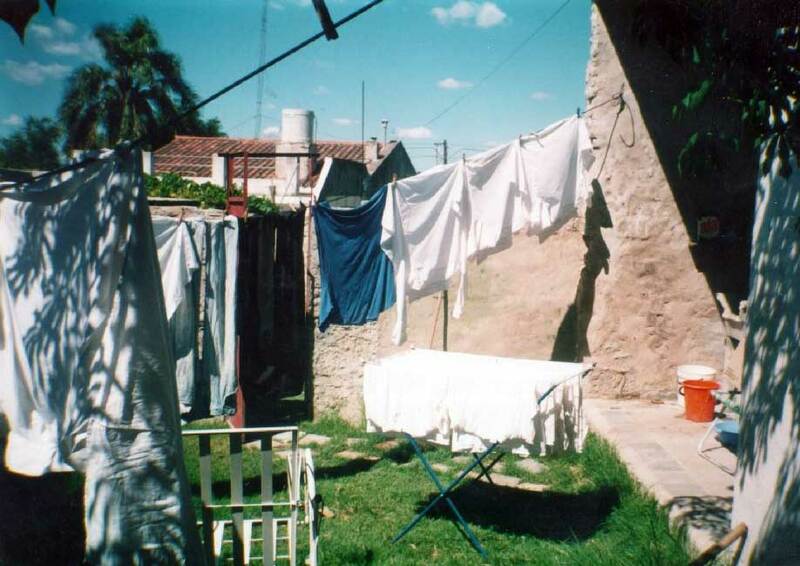 In at least half of my areas in Argentina, there was a woman in the ward who would wash our clothes. Usually we would pay her about $20 each, which was decent income for them, and well worth it for us. 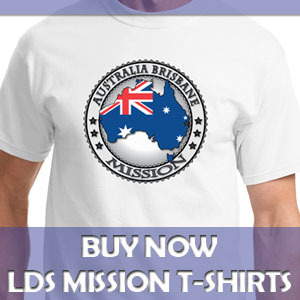 Click here to see a video I made about doing laundry on my mission. 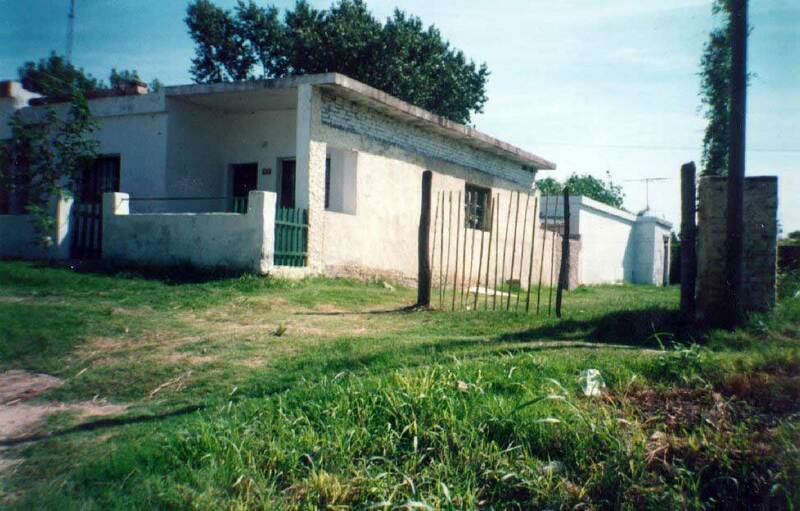 Here’s the outside front of the home where we had our apartment in the Gazano Branch in the city of Paraná. For our weekly service one week, we started building that fence off to the right. 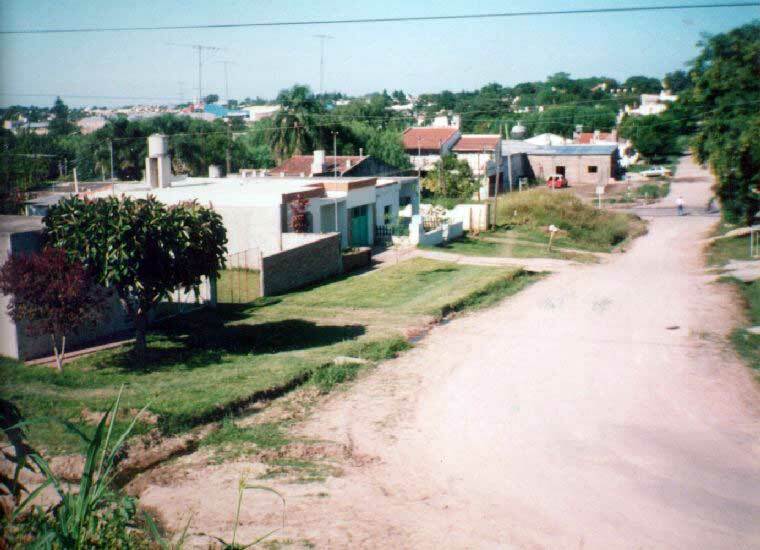 In the picture, behind our home, is another home of the Almada family. This family moved in about the same time Elder Loesener and I arrived in the city. We struck up a friendship with them and they were baptized a couple months later. This is a picture of the neighborhood where our apartment was located. Our home is there in the middle. The house was located on a bumpy dirt road, though you can see a paved road crossing on the right side of the photo. 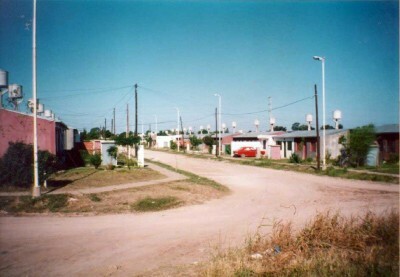 We were near the outskirts of the city Paraná. If you walked a few blocks toward the city, all the roads were paved. If you started walking away from the city, more and more of the roads were dirt. I’ve always remembered this bumpy dirt road by our apartment because in one of my first weeks there, I severely twisted my ankle, yet my body went unharmed. 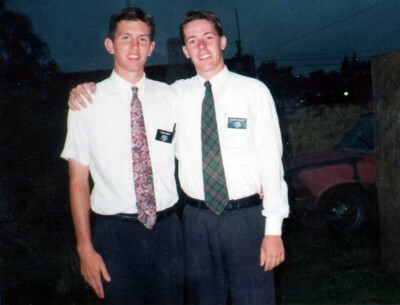 In the year previous to my mission I had had two severe ankle sprained that required me to use crutches. I feared that I would sprain my ankle on my mission and that would limit my mobility and the amount of work that I’d be able to do. This is the Almada family: Fabian, the father, Silvina, the mother, and their four children. They were great. They were so friendly to us, and they embraced the restored gospel when we taught it to them. You can see the Books of Mormon on the table. We would sit around that table for all of the discussions. 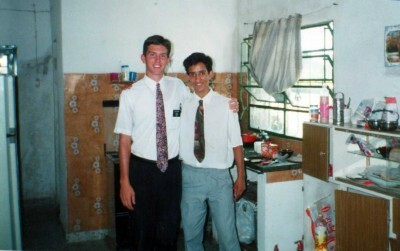 Elder Loesener did most of the teaching since I was new and my Spanish was horrible. Their home was so small for their family, though it was a very typical home. As I recall, they had this room where this picture was taken, which was the kitchen, dining room and living room combined. Then they had two bedrooms and a bathroom, and I think that’s it. Compared to US standards they were very poor, but they were happy and always generous in sharing what they had with us missionaries. Click here to read more about the Almadas and their conversion to the restored gospel of Jesus Christ. This is the Correa family. 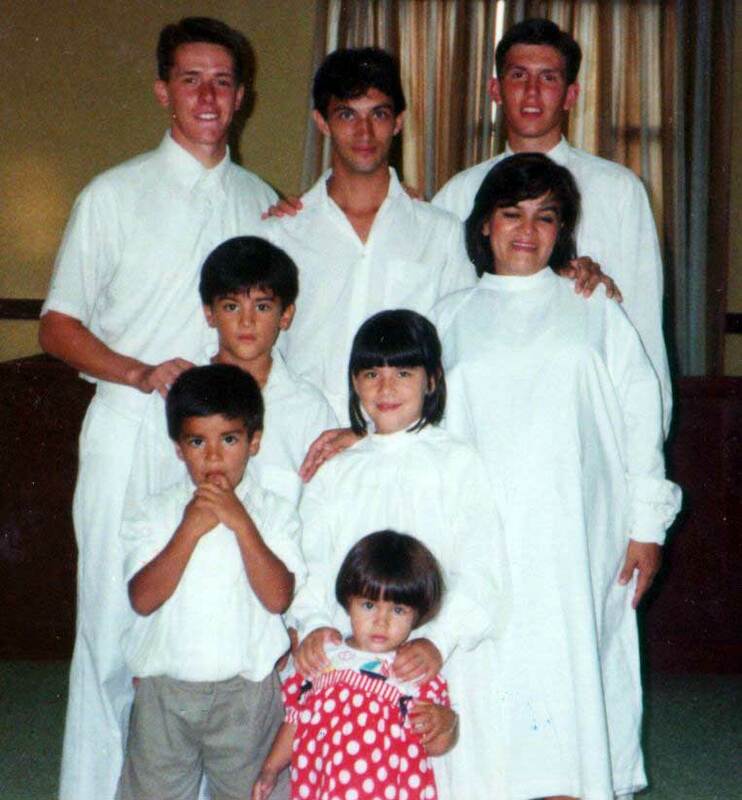 The picture was taken at the baptism of Brother Hugo Correa. I believe Sister Correa had been baptized months, perhaps years, earlier. This family was very poor, even relative to Argentine norms. As I recall, they had a one room brick home with a dirt floor. The home was literally four walls and a ceiling, but at least they were brick walls. Later in my mission I was get to know people who had four walls made of sheet metal. Again, though poor, the Correa’s seemed happy. They had four little girls who were so cute. I remember being jealous of the speaking abilities of their two year old. I felt like this two-year spoke Spanish much better than I, so it motivated me to study and practice even harder. 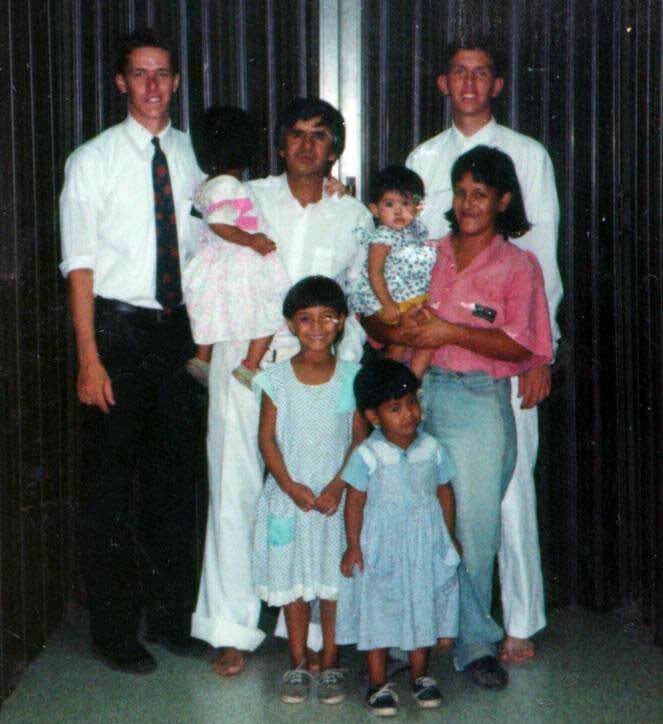 I believe this was my first time baptizing someone on my mission. 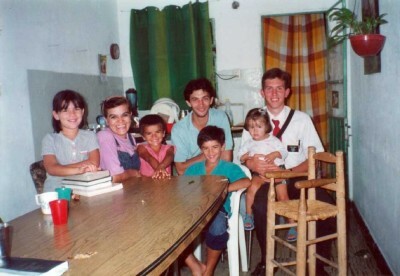 Our missionary district, as most in Argentina at that time, consisted of two companionships, me and Elder Loesener, plus Sister Matsen and Sister Gomez. We had district meeting once a week with them, plus we saw them at church on Sundays. Other than that, we didn’t see the sisters a whole lot. My companion was the district leader, so he called them every once in a while, at least weekly to get the stats on their work. This is a neighborhood not far from the one where we lived, maybe four or five blocks away as I recall. Notice the water tank on the top of each house. Water pressure was always an issue. At best water pressure was weak, at worse it was barely a trickle. To compensate, each home had a water tank on top that was constantly being filled. The house then drew its water from the tank, which gave the home consistently higher water pressure through the pipes. I can remember standing on one of these streets one night early in my mission. We were talking to someone in their front yard, trying to convince them to invite us over for a complete first discussion. The sun was setting as soon as the sun went down, the mosquitos came out in force. I couldn’t believe how bad the mosquitos got in an instant. But I digress. Anyway, this was a typical Argentina sub-development. The homes here are duplexes; two units per building. Each home was simple, likely with one of those rooms that combine the kitchen, dining room, and living room, a bathroom, and two or three bedrooms. This is the baptism of the Almada Family. It was a wonderful event. 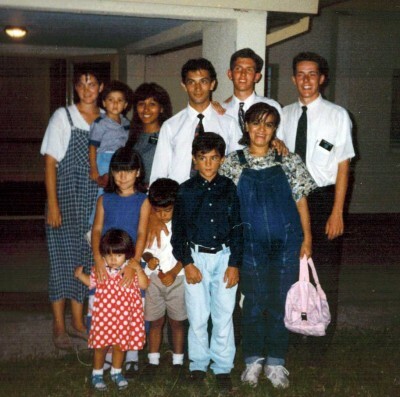 This first photo right before the baptism, and the second photo was taken outside the church building just afterwards. Click here to read more about the Almadas and their conversion to the restored gospel of Jesus Christ. This is a picture of the home owner, landlord, and roommate of ours, Brother Cabrera, with my companion Elder Loesener. This picture was taken in the same room as picture 1, except it is looking in the opposite direction. You can see the cabinet in the left of this picture is the same as the one on the right side of photo 1. Brother Cabrera was always very nice to us and patient and had a good demeanor. I can remember him on the front row of church my first Sunday in Argentina. I was asked to give a five minute talk and he was coaching me through it and encouraging me. I felt sad for him that he lived in the home alone, except for the missionaries. I don’t recall the details of his family situation. This is a young man in the Gazano branch named Mario. One day my companion had to go do something with the zone leaders. Instead of having me sit around the apartment all by my lonesome self all day, we arranged for Mario to go with me for part of the day. This was only a couple weeks into my mission, and my Spanish was still pretty bad so I was glad to have a native with me. But, as it turns out, Mario hardly said a word all day in speaking with people. We knocked doors, and talked to people on the street, and fulfilled other appointments and all the while I did most of the talking. Miraculously, I was able to get a couple of appointments for us to return for a full first discussion, which shows the blessings the God pours out upon missionaries if they will simply open their mouths. Click here to read more about my day with Mario. This was the morning I was transferred out of Gazano. After three months together with my trainer, Elder Loesener and I parted ways. I know I didn’t fully appreciate him as a companion and trainer during the time I was with him, but since then I have grown to appreciate all he taught me. I’ll always have a special place in my heart for my trainer and first companion in Argentina, Elder Maximiliano Loesener. 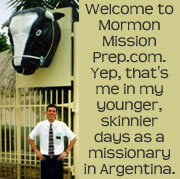 I didn’t see him again until almost two years later when I was on my way home and he met me at the Buenos Aires temple for an endowment session. I was so nervous about this transfer because I would have to travel by myself, first taking a taxi to the bus station, then buying a bus ticket and going to a different city. I got to the bus station, bought my ticket, and then waited, watching the bus like a hawk, because I was afraid I would miss the announcement to load when the time came. Miraculously, I made it to my new assignment in the city of Santa Fe without incident. “Vamos por la sombra” (Let’s walk in the shade) is something Elder Loesener would say often indicating that we should walk on the sidewalk on the side of the street where there was shade, rather than direct sunlight. I was in this area during the heat of summer, as you can tell by the extra tan skin on my face, so seeking shade whenever we could was a necessity. Getting home at about 10:25PM, with just enough time to get in bed by our 10:30 curfew. We found that one of the best times to go contacting was after 8pm when people would sit out in front of their homes and sip mate. This provided a great opportunity for us missionaries to walk through the neighborhood and strike up conversations with people. If we happened to find someone interested in our gospel message then we could easily get caught up in a discussion that would go past 10PM and we’d have to hustle back to our apartment to keep our missionary schedule. Making pizza in our apartment. We would buy a pizza crust, tomato puree, and queso cremoso (literally “cream cheese” but different than cream cheese in the U.S. It was more like mozarella). Add some spices and after a few minutes in the oven, we had a delicious pizza. Pancakes and french toast for breakfast. Bread was inexpensive and we would often have plenty of it. So I’d crack a few eggs in the morning, dip the bread in it, and fry up some french toast. I would also often make pancakes and put Dulce de Leche (kind of like caramel, but a little different) on it. They didn’t have maple syrup, but the dulce de leche was so good, I didn’t even miss it.